My science-fiction work-in-progress is set in a single city, and I needed to see it to imagine living in it. Welcome to Pest! Only walk on gray parts…. Budapest was a proxy in the One-Day War between Greater Russia and Umoja East Africa. Buda is now the White Lake, a boiling toxic waste of microscopic robots that eat carbon dioxide, and anything else, to make diamonds that wash on its shores. Both embargoed no-person’s-land and boomtown, Pest houses thieves, smugglers, engineers, and skaters, daredevil gladiators who jump and spin over the Lake in maglev boots, just one fall from death. I suppose I could have done any old thing to ruin a city, but I wanted a dusting of Science! in my fiction. I thought a fractal would make a believably consistent result small enough for microscopic robots to store. 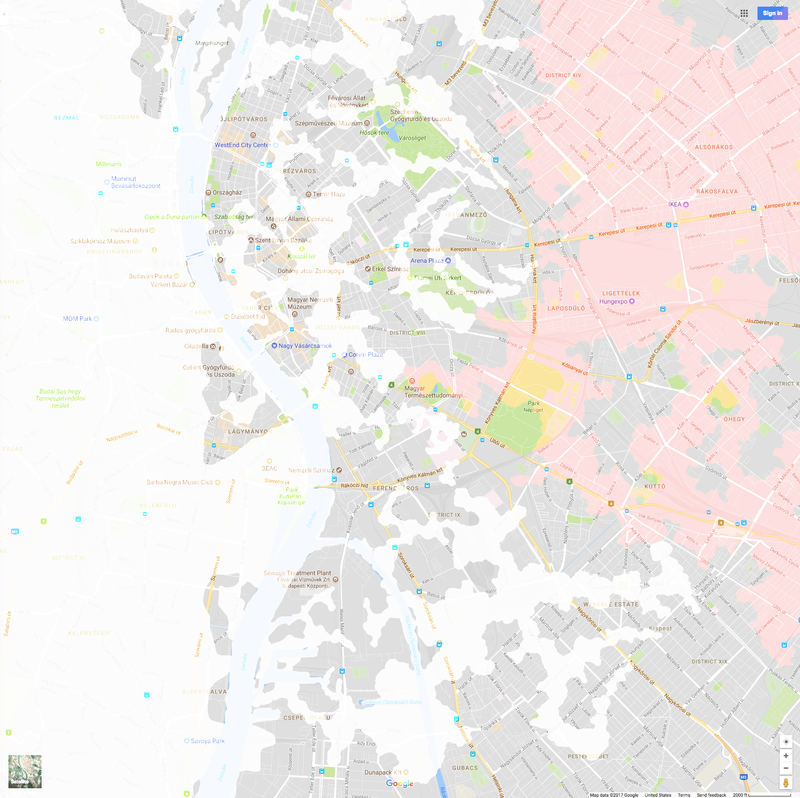 I used FractalWorks, a Mac app, to generate a tiny portion of the celebrated Mandelbrot function, and overlaid this on a large screenshot of central Budapest, so its finer arcs and whorls were the length of city blocks. I didn’t think at the scale of blocks it could ever be so precise – if nothing else, land would collapse – so I cut out the Lake using an image editor’s predictive selection tool, to make the edges sloppy and eroded. Both the pink and white areas are products of the fractal. The white is the Lake itself, while the pink represents Soft Lands, areas of shifting underground streams through which nanites recharge, around which smugglers tunnel. It’s been a huge help to have the reference. Putting my characters on a literal map lets me figure out relative distances, and helps me imagine the land and the city that might grow from it. I also thought further about my mechanical monster’s makeup. Where Lake meets land has always been seductively quiet, since earliest drafts. Instead, let the meeting of Lake and Soft Lands be a place of churn and upheaval, the turbulence of nanites going into and out of dormancy around the buzz of other nanites quantumly-uncertain just where their strange fractal stops. I have a heart murmur too. It’s easier to name things in the context of the city’s weird sense of humor now, and I’m looking at it as more impressively built than previous drafts. Where before it was falling apart and hastily erected, now I see it as printed and reprinted, strange but regular, by the same artificially-intelligent drone “taxibots” that run the city services. This has new virtues and a very different look. And some rewriting. This entry was posted in craft, novel and tagged Budapest, fiction, fractal, future, futurism, Mandelbrot, Mandelbrot function, map, place, sci-fi, science, Science Fiction, setting, sf, technology, The Cooperative Spiders, worldbuilding, write, writing on January 1, 2018 by .